Central Business District, Seattle, Washington, United States of America On my last evening in Seattle the dust that had hung over the city for the first day or two had lifted and the view had finally become good enough to enjoy Seattle from a higher perspective. 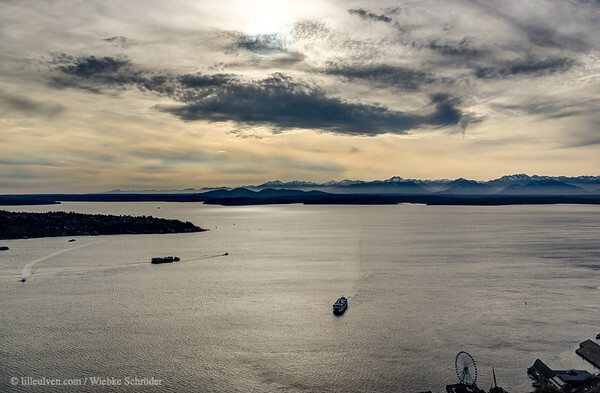 So I decided to get to the Sky Observertory on the 73rd floor of the Columbia Center, this way I was not only able to spot Mount Rainier but could also include the Sky Tower in my photo. I thought that the Sky Observatory would be on some sort of balcony, so I really wondered if I had taken on too much, but actually it was not, I had to take the photos through the windows instead. As the difference between the lighter sky and the darker city was too much for my camera to take in one photo, I decided to go for a composite of five photos which I then combined as a HDR with an as natural preset as possible. uuid="D83C5DB9-F5E7-4743-A7C3-223E6691EEB2" id="United States of America lilleulven.com _United_States_Washington_Seattle_www.LilleUlven.com_20160406_180639_HDR-3.tif HDR Lilleulven.com"